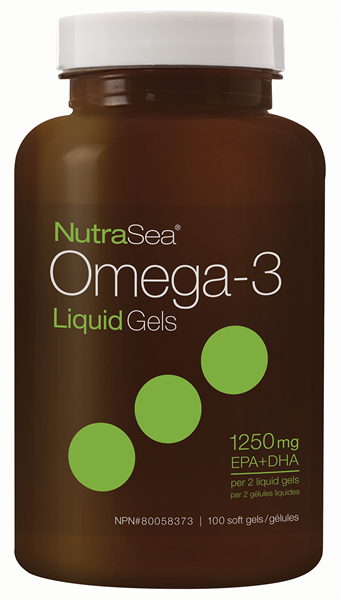 Our trusted NutraSea Omega-3 in just two liquid gels a day; 750 mg of EPA + 500 mg DHA. NutraSea is a great choice for an ultra-pure and balanced omega-3 supplement. With 1250 mg of EPA+DHA per serving, NutraSea Liquid Gels promote the maintenance of overall good health, cardiovascular health, and helps lower triglycerides. Adults and children 6 years and older take 2 soft gels daily. Store in original container protected from light. natural flavour, tocopherols (soy), sunflower oil, rosemary, acorbyl palmitate. Soft gel ingredients: gelatin, glycerin, purified water. 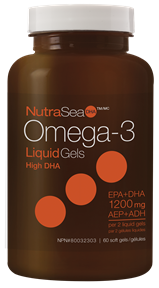 DHA is an important omega-3 for all life stages. Good for you. Great in shakes! Chocolate flavoured omega-3 formulated to taste good in every teaspoon and in smoothies.